Diego Rodríguez de Silva y Velázquez (June 6, 1599 - August 6, 1660). He was an important Spanish baroque painter of the 17th century. His paintings are of the royal family and scenes of daily life, as well as scenes based on Roman mythology. Velazquez is considered the greatest painter of the Spanish School. Velázquez was the court painter of King Philip IV of Spain. In portraying the royal family, Velázquez generally painted a bust-length portrait from life, creating full-length versions. 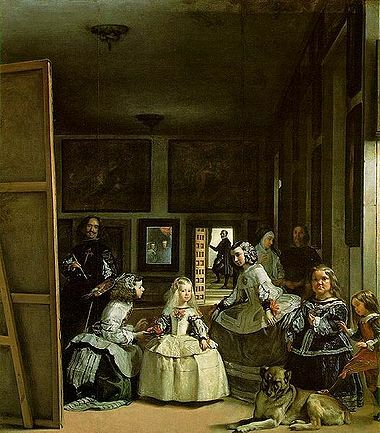 "Las Meninas" (1656, "Maids of Honor") is Velázquez's most important painting and his career ending work. Diego Velázquez's artwork was a model for painters like Edouard Manet, Antonio Puga, Pablo Picasso and Salvador Dali. Velázquez married Juana Pacheco, the daughter of his teacher Francisco Pacheco. The Adoration of the Magi, 1619. "Luis de Góngora y Argote"
The Waterseller of Seville, 1623. The Forge of Vulcan, 1630. Manet/Velázquez: The French Taste for Spanish Painting The Metropolitan Museum of Art. VELÁZQUEZ Web Gallery of Art. Diego Velázquez - Biography Olga's Gallery. Diego Velazquez Jewels of Spain. This page was last modified on 12 May 2017, at 16:47.